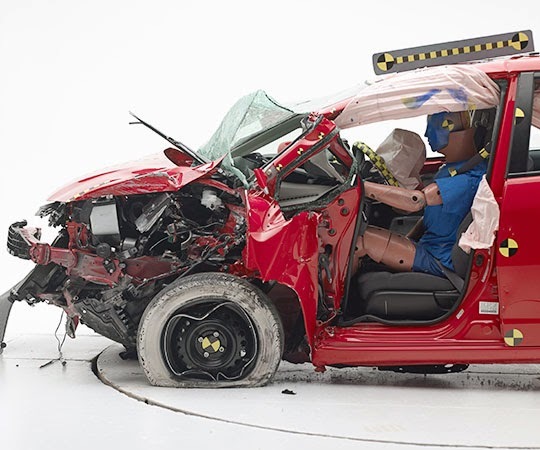 Maybe you've already heard, but the Insurance Institute for Highway Safety (IIHS) has performed its latest round of crash tests, this time on mini cars. The results were not so good. The organization crashed the Chevrolet Spark, Mazda2, Kia Rio, Toyota Yaris, Ford Fiesta, Mitsubishi Mirage, Nissan Versa sedan, Toyota Prius c, Hyundai Accent, Fiat 500, and Honda Fit. The cars are ranted either Good, Acceptable, Marginal, or Poor. The only car to get an Acceptable rating? The Chevrolet Spark. Both the Fiat 500 and Honda Fit got Poor ratings. Shortly after these tests results were announced, Consumer Reports magazine, the bastion for all things rated, dropped the Honda Fit's "Recommended" rating. "Small, lightweight vehicles have an inherent safety disadvantage," says Joe Nolan, IIHS senior vice president for vehicle research. And in other news, fire declared hot; water determined wet. Sky also blue. More at 11:00. Don't get me wrong: I am all for increasing safety in cars. I think we need to keep pushing the limits because, frankly, I don't think the automakers would do it on their own. But the problem I see with this is it basically says you need to own a big, heavy automobile to be safe. Quick—everyone run to your huge cars, SUVs, and trucks! Your small cars are death traps! But then again, maybe those big "cars" aren't safe enough. Maybe a Peterbilt or Freightliner semi tractor would be better. I mean, they're the biggest thing on the road. And if it's bigger, it's got to be better. Then again, maybe we can all find used armored cars to be really safe. Can we make a tank road legal? I'm willing to be that today's crop of small cars is orders of magnitude safer than small cars from 10 years ago. And those small cars were likely much safer than cars from 10 years before that. Again, I'm all for increasing safety in vehicles. But Joe Q. Public sees these results and thinks small cars = suicide machines. 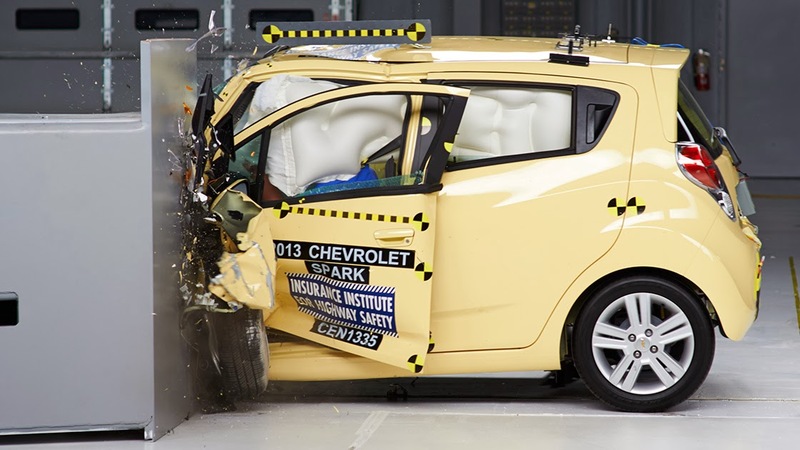 Will the IIHS's results have an effect on subcompact sales? I don't think it'll have a negative effect. It might help continue the Chevrolet Spark's unexpected sale success, though. To be honest, I don't think we'll see a blip in sales. Why? I drive a small cars because I want to. But many (most?) people buy them because they're generally less expensive than larger cars, so therefore, those sales will continue as they always have. Some people truly don't have the cash for anything else. We've made so much progress in terms of safety in the last 20 years, especially when it comes to small cars. It's obvious that smaller cars are at a disadvantage in crashes; it's a liability most of us understand, and many of us live with. Hey, motorcycles are inherently "dangerous" too, right? But that's a risk people are willing to take as well. I'd hate to see small cars decline in sales due to these tests. 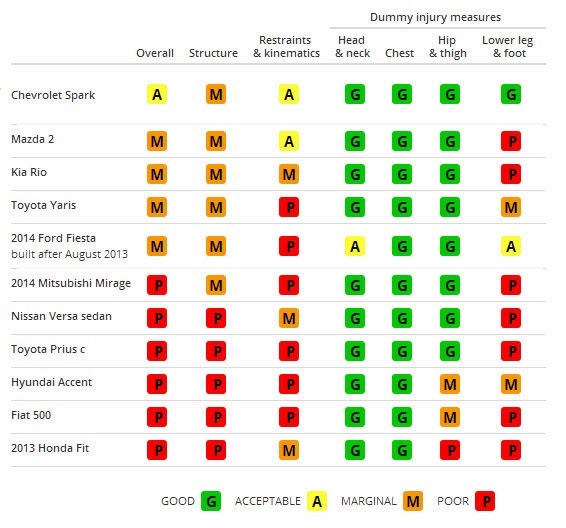 Hopefully the public will apply some common sense to these tests and realize that even the worst of the ratings these days are still much better than older cars. I'll tell you what: I'm not going to stop buying small cars because of these tests. Sure, I'll take a look at the ratings, but these ratings will not scare me away from driving small. Here's the full ratings chart. I agree with your thoughts on this. I own a Honda Fit. And every other test that has been performed on that car has proven it to be exceptionally safe. Of COURSE there are risks to driving a smaller car. Just like there's other risks when driving an SUV. To be fair, I was already assuming if I drove my Fit directly into a tree, I'd be kind of injured. This test is not just about small cars. Many other cars perform similarly in this new test, since this generation hasn't been designed with this test in mind. This seems like a sensible take on the news.